While walking home after school, Z was standing in between L and me and we were holding hands. Then we crossed the road and Z was angry with jiejie for pulling him a little too hard. L : We have to cross the road faster. I don't mean to pull you hard. Sorry! At this moment, Z jerked jiejie's hand and she fell! It happened so fast! Me : How could you do that? We have to cross the road fast. What happen if there are cars coming? Apologise to jiejie now. Me : You don't have to apologise to mommy.... Next time don't do such thing ok? L : (pitiful look) It alright, but very painful you know.... I am going to tell daddy what you did. L :I have to tell him but I will tell him not to scold you. Don't worry. At that moment, I feel like laughing. So bad right? I love the conversation they have with each other. Jiejie was angry with didi but yet want to "protect" him (from getting punish by daddy). They may fight with each other but the fight will not last long, usually for few minutes only or even less. 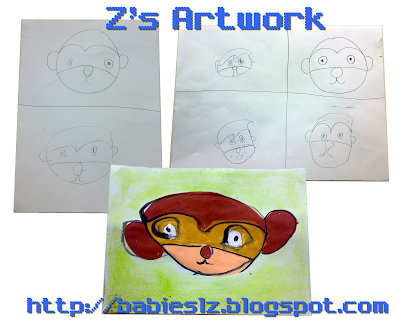 After completing one of the designated syllabus, we have an assessment report on Z (yesterday). When I pick up L today after school, she ran towards me and told me her graduation picture are ready! You know what? I was actually trembling.... Not how the picture turned out (coz I know she beautiful ;)), but how time flies! I knew that I will be enrolling her for P1 by next month, she is graduating this year but but..... It hit me that it is going to happen very soon. She is going up so fast that I wish it will slow down a little, to let me enjoy more..... When she goes to primary school, she will spend half a day or more in school. It was my Mom's birthday and we are not celebrating with her :( She has a party to attend and I'm jealous. Hehehe.... My aunties & uncles from overseas has all come back for the gathering and they chose to meet up today. My Mom decided not to change the date as she doesn't want the hassle of arranging another date. L was a little disappointed that we never celebrate Porpor's bday, she is not the only one, I was disappointed too.... Nevertheless, I hope she had fun. 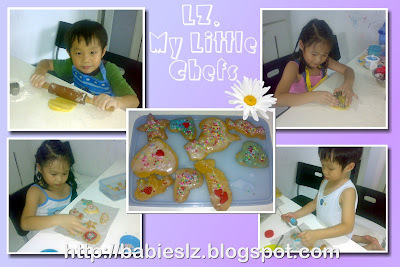 LZ looked forward to school today especially L, she said "I wish there is no school holiday! " . Ya... Wait till she is in primary/secondary, I'm sure she look forward to it :) I thought she did not enjoy with us being at home so I asked her, her reply? "I want to go back to school because I learn many things in school. My teachers teach me many things!". Probably she sense how I feel, she added "don't worry mommy, I enjoy with you." Ohhhh... She is such a sweet darling! I was worried that Z may be reluctant to go to school, but I was wrong. He excitedly put on his uniform this morning and reminding jiejie and himself that they have to bring the candies (yoghurt candies) to school for their friends. Once a month, I let them choose something to share with their friends in school. When we arrived at school, he knew what he was supposed to do, put his file and bottle in their respective place. Then he went to the hall and give a bigh smile to his friends and teachers. Last day of school holiday and yet to bake any cookies with them so today after church, we went home to bake it :) They had so much fun and I did too! So what was daddy doing? He was cooking dinner! This morning, LZ and my parents went to my aunt's place, who just came from UK for a short break. I think this was the 1st time my aunt saw Z. Therafter, they went to the mall with my cousin who spent so much money on them in an hour, buying transformer and balloons. I can't believe it when I find out that the balloons cost $15 each! My mom told me LZ were very well behaved throughout and my relatives were full of praise for them :) I was relieved when I heard that coz they 'bully" their grandparents when I'm not around. 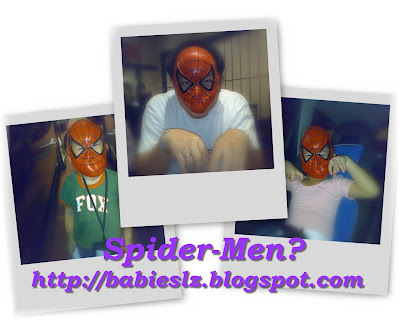 LZ have been talking abt the movie, Surf's Up so we went to watch the movie with godparents (visit the site for games). We enjoyed the movie, it was funny. 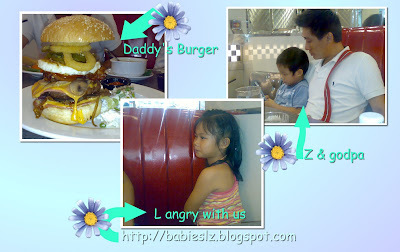 After the movie, we went to Billy Bombers for dinner as daddy was craving for their 'Giant' burger. While we were chatting happily, godpa & Z were engrossed in the gameboy. Then daddy said "L, you have a strand of armpit hair! ", godma and me burst out laughing and played along with daddy, teasing L. She looked at the mirror to check if she has armpit hair. I even took a strand of my hair and told her I plucked it from her armpit. Hahaha.... She was very mad with us but after some time, she laughed with us too. This was their last holiday programme that I have enrolled them in, save the best for the last :) They looked forward to this! 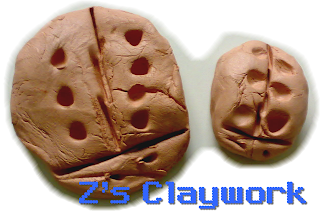 I expected at least 2 teachers in the class with 20 students but I saw only one, good thing was that L was with Z. When I went to pick them up, both were still busy decorating their doughnuts, each of them have 2 to bring home, 1 with sugar and the other glazed with chocolate. 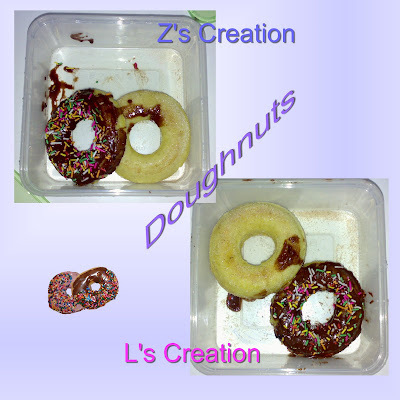 L finished 1 of her doughuts as soon as we got home and Z ate half of 1 doughnut. They are keeping it till tomorrow. 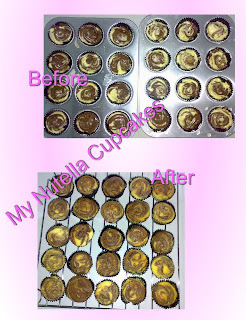 While LZ were at their doughnut making class, I decided to make some nutella cupcakes. I made the mini ones instead..... I think some of it I put too much nutella (I was greedy, hehehe....) and I can't swirl it well. 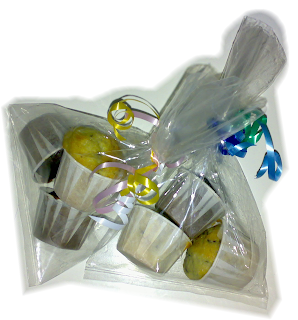 -Line 12 muffin tins with paper liners. -Cream together butter and sugar until light, 2 minutes. -Add in eggs one at a time, until fully incorporated. Don't worry if the batter doesn't look smooth. -Add vanilla. Stir in flour, salt and baking powder until batter is uniform and no flour remains. 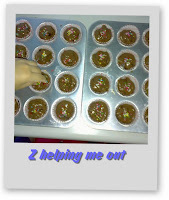 -Using an ice cream scoop, fill each muffin liner with batter. -They should be 3/4 full, if you're not using a scoop. 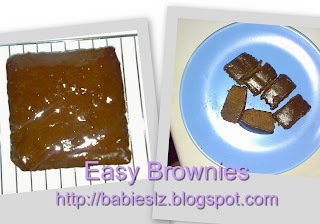 -Top each cake with 1 1/2 tsp Nutella. -Swirl Nutella in with a toothpick, making sure to fold a bit of batter up over the nutella. -Remove to a wire rack to cool completely. That's how old my girl is now... It is amazing how time flies! She loves to make up songs and once awhile, she will have a little performance for us. Daddy will have to begin with "Ladies & Gentlemen..... "
She loves to draw and recently she will write sentences with her pictures. Her favourite TV channel is Kidscentral. She knows all the programmes unless they are new. She knows what events are coming up or what's the latest toys from the channel too. She placed a calender on her bedhead and she knows the date better than I am! When she wakes up and I am still sleeping (lazy me), she will not disturb me. She will pick a book to read/do homework/turn on the TV /do some drawing. OR says "mommy, can you sleep on the bed with me?" At times, he wants daddy to sleep with him. If daddy says he yet to shower, he says he will wait. And he mean it! Sometimes he thinks that daddy talks too much, "daddy, you talk too much! I want to talk! " Whenever we asked him what he want for lunch/dinner, it will be "cold noodles", "char siew rice"
I started training him to drink his milk from a cup couple of months back. Now, he says "mommy, I am a baby. Baby drink from a bottle." 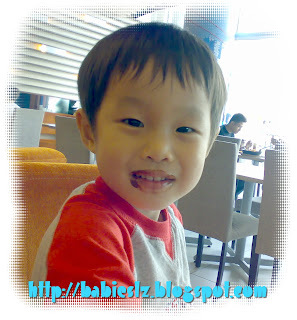 His favourite characters for now are Spiderman, Shrek, Power Rangers, Transformer. He loves to go to the cinema for movies. He wants to watch Surf Up, Shrek 3, Fantastic Four and Transformer. He still likes to help me out in the kitchen. Washing rice or vegetables or help me out with my baking too. He loves his godparents and everytime we go out, he will ask if they are coming. Once he was very upset that he can't go sleepover at their place. Once we were at Hans and I ordered a plate of fried beehoon (horfun style) for him. I can't believe he can finish everything! He likes to climb on sofa, the bench and my piano! Lately he 'complains' alot when jiejie 'bully him. "mommy, you know, jiejie...... " . Then he will happily tell jiejie "I told mommy! She is going to send you to the corner!" His current favourite toys now are train tracks especially Thomas, lego blocks, character toys, cars and of coz gameboy! When he is angry, he pouch his lips, fold his arm and walk away. We just have to leave him alone for few mins and he will cool down. 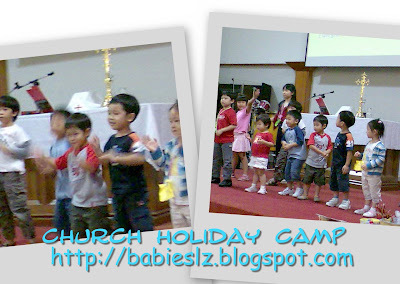 Whenever they are attending church service or any programmes, L will hold Z's hand and walk into the class together. She will give in to him most of the time "Jiejie let you have it ok? ", "You have it 1st, later then my turn ok? ", "you press the lift now, then when we come home, jiejie will press ok?" When I ask Z to pack up the toys, she will pack up for him. Now, she has spoilt her didi, coz when I ask him to pack his toys, he says "jiejie please pack up for me"
When I give them snack or fruits, she used to fight to have it 1st but now, she says "didi you take it first"
They used to compete who dress up first after shower or wearing shoes, usually L will be first then Z will be upset. Now, they will wait for each other to complete it at the same time. I'm very blessed to have such sweet daughter and son.... I know one day if I'm not around, she will be there to take care of her brother, making sure that he is well taken care of and making sure that no one bullies him.... Likewise, I hope didi will do the same for jiejie. When he grows up, he will take care of jiejie and don't let anyone bully her too. Think twice before you do anything. Children learn from us. L: Mommy, how to make you happy when you are angry with me? Me : Hmmm... Let me think... Think what you have done wrong and admit it, apologise, hug me, kiss me, make funny face to cheer me up. How's that? L : You mean if I do all these, you will not be angry with me? Me : If you do all those and you don't mean to do it, mommy will not be angry with you. I omitted the nuts as LZ and me like it plain... Daddy seldom have it, unlike my all time supporters, LZ! We arranged to go to Wild Wild Wet with Boon's family on Saturday since we have free tickets and off we go at 10+ in the morning. It was raining when we left the house and I told LZ if it continue to rain when we reached, we will have to cancel the outing. They started singing "rain rain go away" and when we arrived at WWW, it stopped! It started raining at 3+ so we told LZ it was time to go home, they asked for few more rounds of the slides before they reluctantly changed their clothes. The weather was great and I was glad that we went today :) In the evening, my friends came over for MJ session! What can my hands do? 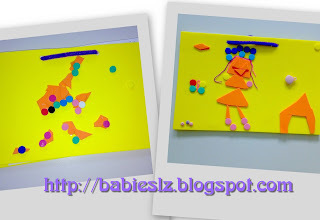 For Z, he told me he enjoyed the crafts and dancing but I doubt he enjoyed as much as jiejie. There were only a handful of boys and they were older than him and his group (the youngest ones), he seemed like the only boy. Z, unlike L, he needs more time to warm up to others too. Good thing was that they did things that he likes. I was glad that during sit down lessons and lunch, L was besides him. At the end of the 3rd day, they had a mini concert. They were hoping daddy can make it but he had a meeting on that day. L wasn't shy at all and looking at her, she is pretty good at dancing. 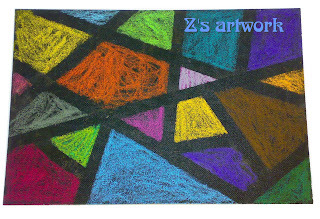 Z, was sitting on the floor. I think if the teacher did not hold him up, he would have sat down through out the performance. After the performance, I asked him what's wrong.. He said he was angry with one of the girls who was "pestering" him and jiejie confirmed that. 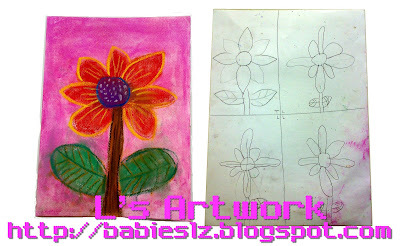 The difference between LZ art pieces is that L is doing shading and Z is doing 1 colour. I asked Z again whether can I cut my hair and his answer is 'NO' again. I love the way he said no :) Actually I have decided not to cut it very short but to trim it only. I was going thru my hp voice recording and I realised that I forgot to note it down in the blog. Z : Mommy, you know how to be God's children? Looking through the videos in my video bars, I realised I have posted only 1 video of L talking. It was either she was singing, performing or playing so I decided to post one here. She has been playing with her baby doll for a long time. "Ginny" sleeps with her and sometimes "eat" with her =) When she does her homework, "Ginny" will be her companion too. We were interrupted when my HP rang :( so you can only hear half of the song. This afternoon, L went for the lollipop class (children age 5 yrs to 10yrs). She spent 3 hrs there and came home with a "certificate" and 2 lollipops. At the end of the lesson (before wrapping their lollipops), they were asked to fill up the "test" paper. Looking through the paper, I thought it was tough for her age but she did pretty well. I asked her if she fill in the blanks herself and she told me she did it on her own. She also said that when didn't understand what was the question, she asked the teacher. Well done Sweetie! Me : Who will get the lollipops? L : I'm giving the chocolate one to didi. I know he likes chocolate... The strawberry one for me because I like strawberry. Me : Oh! How about daddy and me? You mean we don't have any? L : Mommy will take a little from didi because you like chocolate and daddy will take a little bit from me. L was watching her fav programme while I was baking so Z came to the kitchen to help me to put the sprinklers on the cupcakes before I put it into the oven. We arranged to go to the beach with Boon family so I rushed to get some ingredients to cook pasta for the picnic. 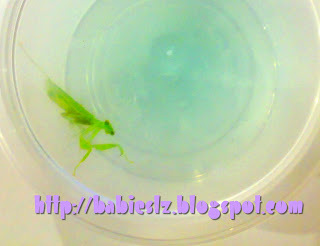 It was my friends 1st time tasting my food and they like it including baby Javier! Godma tasted it for the 1st time too (in my house) :) She said it tasted just like the one she like from Pastamania. I'm flattered! L : Mommy, did godpa & godma came to our house last night? Me surprised : How did you know? L : the mahjong table. When the table is out means that they came over. With the look she showed us, we arranged with godparents to meet for dinner. We went to Marina Square and had dinner at MOF @ My Izakaya. The food is great but service can be better. I had to ask for the fork twice before they give it to us and DH asked for coffee but they served him tea. 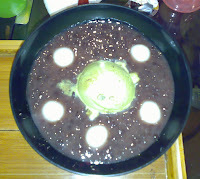 If you go there, do try out their dessert Macha Zen, it's yummy! Me : I thought of cutting my hair. I want it short. What do you think? Z : No! Mommy must have long hair! Me : But it's so hot! If I cut it short, I will not feel so hot. Can? Z : No! No! Mommy is a girl. Cannot cut! Me : Ayesha has short hair too and she is a girl. So why mommy cannot? Z: Mommy look pretty with long hair, so you don't cut your hair. He insisted that I should keep my hair long. Me : Sweetie? Can mommy cut my hair? L : You mean very short like Ayesha? Me : Yes, like Ayesha. She looks pretty with short hair. So can I cut? L : OK. (she turned and looked at her bro. Z protested and L changed her mind)Mommy, I like you with long hair and you look pretty, so you don't cut ok? They looked so cute right? We got the mask free from our favourite Japanese restaurant. While waiting for our table, they served drinks and that include beer at the waiting area. We like it there coz the food yummy, service is great and they pays lots of attention to the little ones (giving out toys and snacks). I don't prepare home-made pizza base, why bother to make when I can get ready made ones? OK... 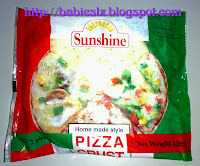 I admit I am lazy :D I usually use this one as we like thin crust.. There are 2 pizza baze in a pack and LZ took one each. After that, just put into oven and bake it! Simple right? It was a quick & easy meal. I don't think I need to write down the method :) We have fun preparing lunch and hope you will too! This week I brought LZ to the wet market twice, it wasn't their 1St time to the market though.... When we went there few days ago and before we leave our house, I warned my kids not to say things like "yucks", "smelly". I was worried that they would blurt out words like these.... Lucky for me, they did not. The only thing Z said was "mommy, let's go. Let's get out of here." 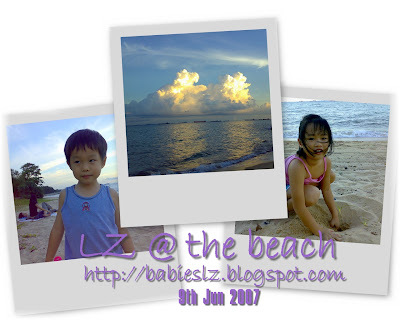 I still remember the 1st time we bought L to the market when she was very young, she said "so smelly! " . Now that she is older, she is more considerate. She knew if she said things like this, she may hurt other's feeling. They don't get to go to the wet market often.... So this school holiday, I would like to bring them to the market more often. I want them to know that you can get fresh food not from supermarket only =) Let them see the food that they sell especially the different types of fish etc. They have been behaving themselves these 2 visits. They waited patiently at the side, either I was choosing the items or waiting for the aunties/uncles to clean/prepare food. Z did mentioned "let's get out of here" again but this time, he said it softly. Today at the market while I was buying something, I asked L if she remember where is the chicken stall as I wanted her to pick up the duck for me (wanted to see her reaction). To my surprise, she said ok, then holds Z's hand and they walked towards the direction of the stall. Don't worry, they were within my sight (I followed them but kept a distance) =) After collecting the duck, they waited for me in front of the stall. Impressive huh? 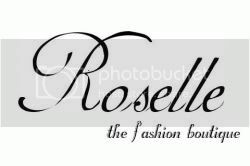 Soon, I can ask her to do marketing for me :D Oops! Daydreaming again! Me : How did you know jiejie went for the show? Did she tell you? Or someone else? Me : (Shock and turned to L) Jiejie, 你告诉弟弟吗? She was shocked that didi knows too. Z : I find out myself. Jiejie did not go to 伯伯's house for a swim. I know she went for the show. Me : Are you angry with mommy? 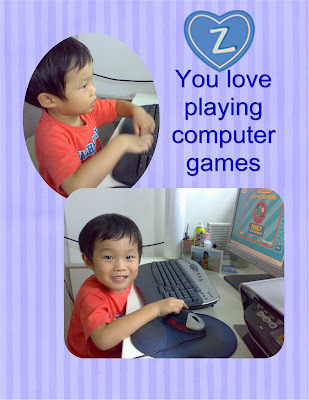 Z (smiling): No, because I swim and play in 伯伯's house. L : Mommy, next time we bring didi go see the show ok? After a few days of fun, LZ are still full of energy! Before bedtime, they were playing with their dinosaurs. They enjoyed setting up the mat for their dinos. We had a date we godma! I promised LZ I would bring them to Ikea @ Tampines again so I asked godma to go with me. After lunch, we send them to the play area and I can''t believe that we had to wait, we had about 10 over kids ahead of us. While waiting, I signed L up for the Smales, a kids club by Ikea. Each time we visit Ikea, L will get a stamp. In the evening, I saw a bruise under L's chin. Oh dear! She hurt herself at the play area and daddy will be very mad when he finds out. When I rubbed it for her, she said it doesn't hurt. Haiz.... If daddy finds out, he will probably forbid me from leaving them at the play room. Anywhere, I think LZ had enough of fun for the past few days and mommy needs her break. Gosh! I'm very tired and so is daddy.... We will not get out of the house unless they are going for their classes. 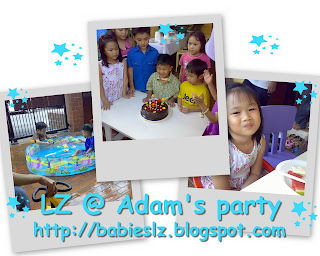 We attended Adam''s birthday party after victory kids. Thinking that we are quite late for the party, I did not heed Safia's advice to pack swimwear for LZ. LZ were wet after the waterplay. We had to borrow Adam's clothes for Z. The girls had fun dressing up with Ayesha's princess stuffs and the boys played with water guns and cars. Safia prepared wonderful meal for the guests especially the chocolate cupcakes and samosa. 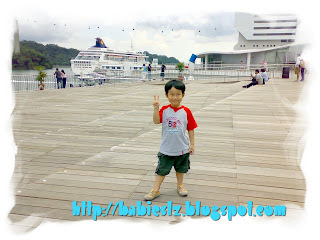 We went to Vivo City since we have not been there for quite some time. Goodness! The place was packed! Feeling tired after shopping and while waiting for Boon & family, we stopped over at Swensen. We ordered the ice cream fondue and calamari. Fondue was good but the portion for the calamari was miserable. 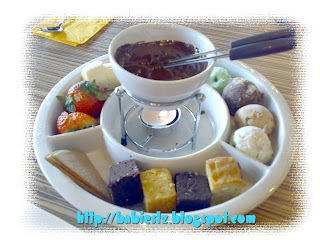 In the evening after picking jiejie, we had steamboat with god parents and Boon & his family at Golden Mile complex. Few days ago, Michelle asked if my girl can go over to their house after the the camp. Of coz she can! I know my girl will be thrilled! 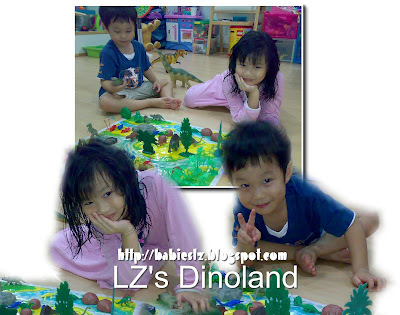 L spent time at their house, playing with the sisters, Rachel & Charmaine and Janice was there too. 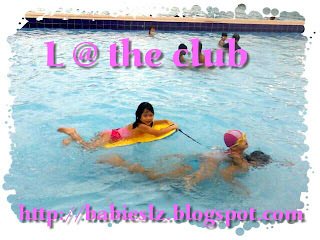 After playing games and face painting, Michelle brought the girls the the club for more fun, swimming! Michelle wanted to take a few pics of her with her face painted but she said only mommy can take pics of her. During those few hours that she was not with me, I missed her alot.... Yeah... I see her everyday but I just don't get enough of her. Every time she is not by my side, I feel lousy. I would be wondering how is she doing, does she miss me as much as I miss her..... Sweetie, mommy wants you to know that I missed you terribly when you are not by my side. I hope that while you are having fun, do think of mommy ok? It was very rush in morning, getting LZ and myself ready by 0830hr. I was worried intially that I will have a hard time waking Z as he was not used to getting up at 7+ unlike L, but my worry was uncalled for. He happily got up and was looking forward to it. 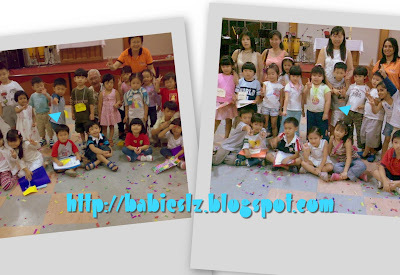 By the time we arrived a 0855hr, the hall was packed with daddies, mommies and maids. After making sure that LZ are settled, I left for home. Time passes very fast and I was back at the camp at 1245hr to pick them up. When I arrived, they had just finished their lunch, MacDonald & KFC. 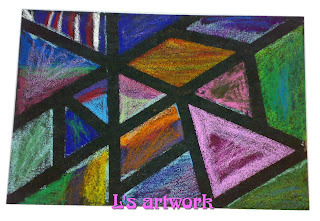 L Z told me that they enjoyed themselves and are looking forward to the next day. I was very glad that I signed them up for this. 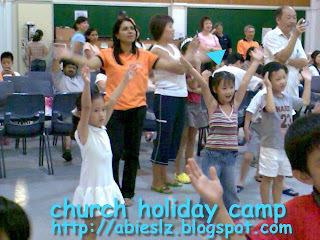 They did art & crafts, songs, storytelling, games and learned alot during this 2 days camp, honesty, sharing/giving and kind. They made new friends too!